It will be a special moment in an equally special setting to celebrate your loved one, make them feel unique and let you both be rapt by chef Vito Paradiso’s delights. 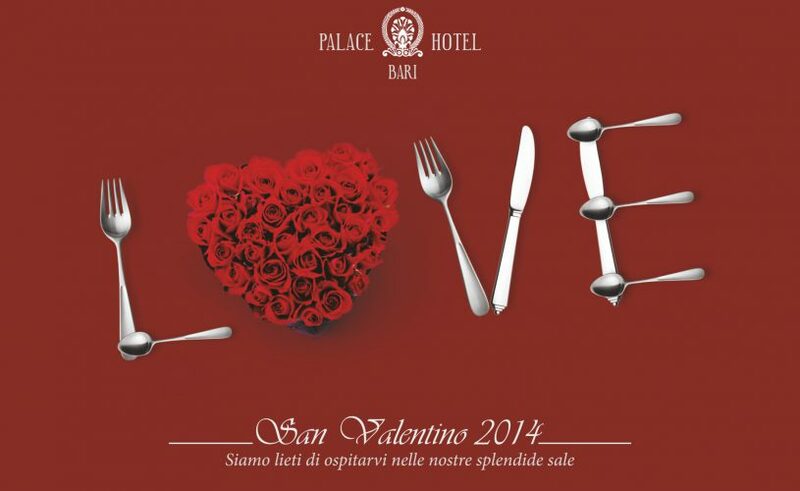 We are happy to let you enjoy an unforgettable Saint Valentine’s at only 50 euros. Tonight’s guest: Will Diamond, singer and performer of the best underground, funky, disco, electro house, and dance clubs. We offer special prices for those who also spend the night and book early calling (+39) 080.5216551 or writing to info@palacehotelbari.com. Oysters and salmon pearls with a sparkling welcome, cous-cous salad with crunchy fennel, strands of burrata and marinated red shrimp. Creamy rice with red turnips, ginger calamari soup and tarragon leaves. Paccheri pasta with blue lobster sauce on an emulsion of cannellini beans and extravergin olive oil. Steamed sea-bass on aubergine purée and tomato pesto sauce with chilli pepper. GRAND FINAL with “melted” Rocher, chocolates, and sparkling wine!